View of my recent working place. I always loved old stuff and I climbed castles and went to museums as long as I can remember. So it was somehow logical that I chose museum studies when school was finished. By the way, my job center agent considered it a very dumb idea… Anyway, I decided to study in Berlin, at the „Fachhochschule für Technik und Wirtschaft“ (FHTW, University of Applied Sciences). This meant that I had to do 6 months of internship at a museum or archive to fulfill the entry requirements. I did this in the Landesmuseum für Technik und Arbeit (museum for technology and work) in Mannheim. This was the first time I came into contact with the work in museum collections because one of my tasks was to document a collection of about 500 tin cans, reaching from very tiny medication containers to large coffee containers. The advantage of this internship was not only that I was accepted as a student of museum studies in Berlin in the fall of 1998, but also that I had a museum job in my first semester break. The Landesmuseum für Technik und Arbeit had an exhibition on „coffee, how to make it and how it tastes“. I was a combination of a visitor guide and a bartender, explaining how to roast coffee at a roasting machine and afterward selling cups of coffee to the visitors. When there was nothing to do I documented coffee machines and coffee mills and I can still give you a five minute lecture on the principle of the „recirculating percolator“ and why it’s a dumb idea to brew your coffee with it. In my next semester break I did an internship in the Museum für Kommunikation (museum of communication, the former postal museum) in Berlin. They were building up their new permanent exhibition, and so, „unfortunately“, I had to take a break from my studies for one semester because they signed me as project assistant. It was a thrilling time and I learned many, many things about exhibitions, research, textual work, copyright questions, object handling and troubleshooting. I went back to my studies in May 2000 but from this project on there was never a time I haven’t worked for a museum or similar institution. I was working as a freelancer as a side job during my studies. It were different jobs but most of them were linked with special exhibitions. So I learned much about the encoding machine Enigma, Prussian military, clay bricks, paper manufacturing, the agricultural development in the state of Brandenburg, paraments and church history, the human brain and screw manufacturing. I finished my studies in the spring of 2002 and kept working as a freelance museum professional, mainly for the Deutsche Museum in Munich and for the cathedral museum in Brandenburg/Havel. Alongside I was looking for a time contract or permanent job in a museum. 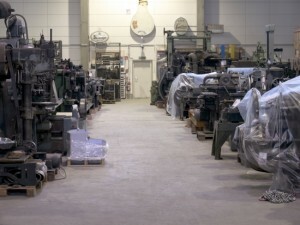 One day when I was searching job announces on the internet a very known name popped up: The Landesmuseum für Technik und Arbeit was searching a curator for their permanent exhibition on synthetic materials and their collection of chemistry objects. Feeling I had nothing to lose, I sent an application, considering my chances very dim, because they searched for a specialist in chemistry. Very much to my surprise they invited me for a job interview and in February 2003 I was back in my „old“ museum which felt like coming home. 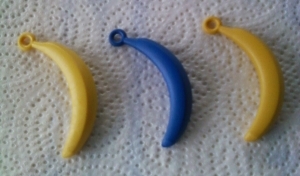 Developing Banana Key Rings (from left to right): Polypropylene let the key ring break too easily, blue was obviously the wrong color, polyethylene with yellow color was just perfect. Being the curator for synthetic materials meant not only curatorial work, but also a lot of registrar’s work. There was a large collection of magnetic tapes dating back to the very first developments from 1934 until the present time and it needed to be sighted and documented. Most difficult was the research on how to store them and how to save the information on them – a problem that is still not solved to a satisfying extend. As you can imagine time past quickly and it was only a two year contract. In my second year there the Landesmuseum announced the position of the „Depotverwalter“ (administrator of outside storage facilities). 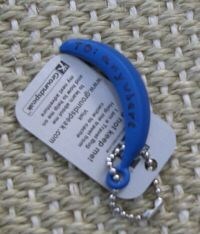 Having again nothing to lose, I applied and was chosen. This marks the point where I switched completely from exhibition work to collection work. It was much later, after we had managed the closing of one of our storage facilities and the relocation of the collection in the remaining two storage halls in 2006, when I tried to explain to an American colleague what my occupation was. I searched the internet and digged out two job descriptions: one of a collection manager and one of a registrar. Deciding my occupation had more to do with the practical issues like physically moving the collection I chose collection manager. Later on I realized that the using of the terms differ from institution to institution, and I’m doing a lot of data base and loan work as well, so I’m a registrar, too. That’s it, folks! That’s how I became – or realized I was – a registrar.